A head-on collision Friday in Poway injured three people, one of them seriously hurt and airlifted to a hospital. The collision occurred about 2 p.m. in the 15800 block of Poway Road, according to Sgt. David Toner of the San Diego County Sheriff’s Department. Upon arrival, deputies found both vehicles, Mazda coupe and a Nissan Sentra, with major front-end damage, Toner said. The investigation revealed the Mazda was eastbound on Poway Road and had drifted into the westbound lane when the collision occurred, according to the sergeant. 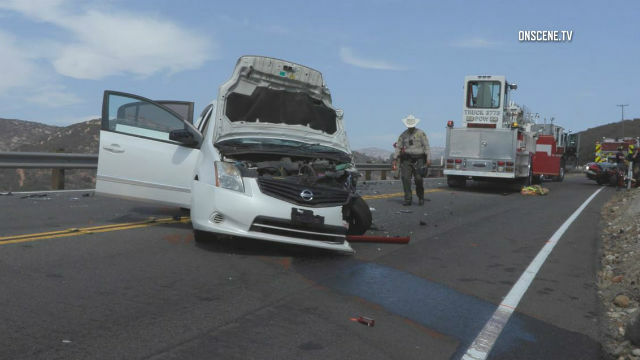 The 25-year-old woman driving the Nissan and her 1-year-old son were taken to a hospital as a precaution, while the driver of the Mazda, a 28-year- old man, was airlifted to Palomar Medical Center for treatment of serious injuries, Toner said. Neither alcohol nor drugs were suspected as factors in the collision, he said. The accident forced the closure of Poway road for several hours during the afternoon rush hour.